I am Máistir Mael Eoin mac Echuid, originally from the Canton of Whyt Whey in the Crown Province of Ostgardr, now residing in the Canton of Black Icorndall (the Canton of the Valley of the Black Squirrel mka Delaware County) in the Barony of Bhakail (Greater Philadelphia area). When initially looking to join the SCA, I intended to learn to brew and cook in a medieval manner and to learn the ins and outs of heraldry. Instead, I quickly found myself fighting heavy list, dancing and generally helping out wherever needed, often hanging out in kitchens at events or holding positions in local groups. I've come to realize that I prefer doing what I can to help others enjoy the SCA; their happiness is my happiness. I was a protege and apprentice of Viscount Alexandre Lerot, Baron of Avigne along with Lady Alessandra Bruccioli, and, until his elevation, Master Pascual del Mar. On February 13th, in the 50th year of the Society, I was recognized as a Companion of the Order of the Pelican. I had a lot to learn to get to this point and I already see much before me that I have yet to learn, whether as a Peer or otherwise. 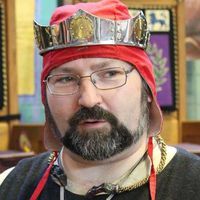 Herr Matthias von Würzburg is active in the Kingdom Webministry and serves the Shire of Nordenfjord as their Webminister. He is also becoming active in the scribal community after resurrecting calligraphy skills to write our fealty oaths/contract. Tiarna Alana O'Keeve is very active in the Thrown Weapons and Archery communities as a marshal and instructor, and is also a Herald at large. She has held many local offices and serves the Region officially, too. Lady Alana and I will exchange fealty at Ghosts, Ghouls and Goblins. Lady Cailleach Dhé ingen Chiaráin is an up and coming officer, very active in the Shire of Nordenfjord. She is my student, interested in group management and growth and I believe she will excel in those endeavors. The Company of the Black Boot is a fledgling household for newcomers, started when we realized there were members in the area who had been around a while but still confused by some of the SCA's terminology, award and group structures, among other things. We modeled the household on one I saw in the Kingdom of Atenveldt - invite newcomers in, help them out for a year or two, then have them leave the household. Since discussing the idea, a number of people have stepped up to help out and we can't wait to do what we can for people new to the SCA. Along with some other local service-minded folk, I am a member of Dar Nafoura Hajjar. Additionally, along with Sayyid Jibril ibn 'Ammar al-Fayyad and others, we are cooks to be found at the sign of the Cross and Crescent...though, unlike many medieval alehouses, our sign may be found here and there rather than along a particular street. Sometimes our kitchen is small, though others often join us in preparing meals for travelers and feast guests alike. I self-identify as a member of Sharc Pit (and they haven't said I shouldn't) and Ysmay and I are honored to be Friends of Tadcaster Militia. Mael Eoin is a 12th Century Crusader originally from Ireland but to be found anywhere between there and the Outremer. He is a Knight Hospitaller, one of the military brothers of a Holy Order originally formed to protect and provide hospitality to pilgrims traveling to the Holy Land. As a landed Baron, he will most often not be seen on Crusade, and the Hospitaller garb has largely been closeted, leading him to wear a slightly more colorful wardrobe for the time being. Our "Social": the non-activity as an activity - EK Service University class on the success of a weekly social, non-focused activity. Groups and websites: HTML, wikis, CMSes and more... - EK Service University class on popular choices when it comes to producing local group websites. Group websites and Social Media: why you need both - EK Service University class on why social media *and* traditional websites are a good idea...together. This page was last edited on 16 January 2019, at 09:12.